Technology moves fast. Really fast. Every day we expand human knowledge and capabilities in such astounding ways that I am often shocked at the massive amounts of new discoveries being made across a variety of disciplines. Our capabilities are progressing so quickly that every decade presents a stark contrast its precedent. Technological progress and growth are not linear, though; the growth resembles an accelerating curve where the more that is learned and invented ends up driving further discoveries and inventions in a positive feedback loop. But the curve is not really exponential, either, because the acceleration is limited for a variety of reasons. That is mainly because exponential growth requires ideal circumstances and unlimited resources, something we clearly don’t have. Through a combination of environment saturation, resource depletion, and sometimes the very laws of physics, growth generally levels off and eventually come to a halt, at least until the parameters of the system change. Take fiber optics, for example: the physics behind the technology was first demonstrated in the mid-1800s, and early advances saw bent glass rods used as medical tools for body cavity illumination and examination. Through research and development, the technology got better and better, yet it still wasn’t until the 1960s (more than a century later) that fiber optics took the form that we are familiar with today. Back then, fiber optics were limited by materials, production techniques, and the scientific understanding of light waves and photons. Now, nearly 200 years since the concept was first demonstrated, we are moving forward faster than ever before, though still at a pace concurrent with abilities and understanding (the human mind is one of the biggest bottlenecks in engineering – as well as the biggest innovator). Compared to the vast history of mankind, the rise of fiber optics has been incredibly fast, but on human timescales the growth feels much more manageable. That is why it isn’t surprising that it took more than 170 years for watchmakers to finally have an interesting reason to dabble in the unfamiliar (for watchmakers) world of fiber optics. Artistic (and a rebellious) Finnish watchmaker Stepan Sarpaneva is one of the men that dared venture down the road of fiber optics, and its part of something much bigger for the independent watchmaker: his first in-house movement. That’s right, revealed for the fifteenth anniversary of Sarpaneva Watches, Stepan Sarpaneva launched Lunations, featuring his first in-house “moonment” starring a fiber-optic moon and a lot of Sarpaneva flair. Sarpaneva always puts a lot of himself into his watches, especially in the highly detailed dials. Lunations matches his previous models in design while exceeding them mechanically. Like nearly all timepieces from his atelier, Lunations focuses on a moon phase complication, this time set in a very large aperture. First off, it is accurate to just a one day deviation every 14,000 years, which puts it just behind the Andreas Strehler Sauterelle à Lune Perpétuelle on the list of most accurate moon phase watches today (I’ve heard that Strehler helped Sarpaneva with the calculations for the moon phase mechanism). This is incredible accuracy for any mechanism, and due to its size (pretty much the entire diameter of the movement), Sarpaneva didn’t have to try and squeeze ultra-fine, ridiculously tiny gears behind a dial. The system functions largely the same way as any moon phase, with two “moons” rotating on the rear of the movement, except here these fill the translucent moon phase window by passing behind it. The moon phase aperture is interesting as it is a laser-machined and hand-finished wafer of optical fiber comprising thousands of tiny optical fibers compressed together making the moon mostly transparent. The two moon disks on the rear of the movement aren’t moons at all, simply disks that fill the transparent fiber optic moon window and, due to the optical fiber, create a white area of the moon (or glow through) to display the current phase. 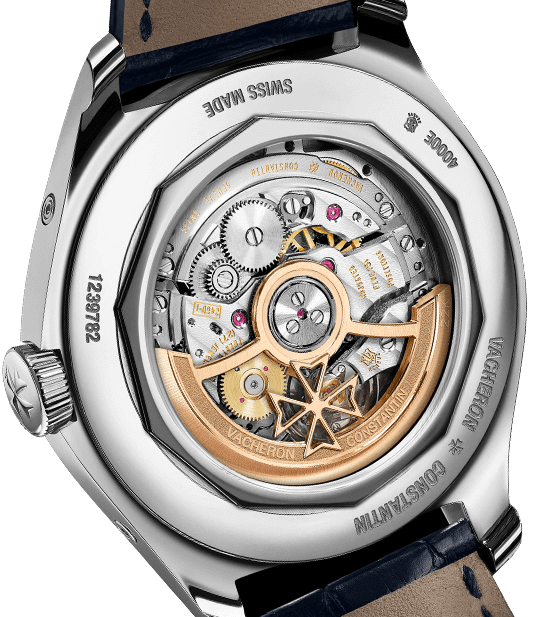 From the rear of the movement, the disks indicator points to a calibrated track around the edge of the movement on the case back. From the dial side, Lunations looks similar to previous models with the double-layer cutout style dial, but surprisingly the entire movement has been skeletonized following the pattern usually seen on Sarpaneva’s dials. The dial really is just a chapter ring around the edge of the movement. The rest comprises bridges, plates, and the gearing. This is a very interesting detail that plays with the idea of skeleton movements while not abandoning a well-defined dial style that has been so successful for Sarpaneva in the past. It also allows for the fun bits of the movement to be seen without making it seem like a gaudy, heavy-handed attempt at adding value. The visible balance is at 2:30, while the visible going train sweeps counterclockwise to 9 o’clock – including the partially visible mainspring. Cutouts provide a glimpse into the movement, increasing visual interest while leaving more to the imagination. The winding mechanism is subtly cool, as it surrounds the optical fiber moon and, thanks to a set of ball bearings, rotates separately and meets with a fan-shaped ratchet click at 7:30. While the design isn’t the most complicated winding system for a manual-wind timepiece, it works within a unique constraint, namely the large moon window through the movement that takes up a significant portion of real estate. Given that everything that is normally on the rear of a movement is on the dial side, the movement is an inverse design with the typical dial-side moon phase mechanism on the rear of the watch. This is all due to the unique way to read the moon phase through the movement and the translucent optical fiber wafer. And since that moon phase is the entire reason for the watch, it make sense for the movement architecture to cater to it as much as possible. A hyper-accurate moon phase is the ultimate goal for a watchmaker in love with the moon phase mechanism. The Sarpaneva Lunations has achieved what only a couple watches in history have come close to. For more information on those, see my article The 8 Most Accurate Moon Phase Wristwatches Today, which thanks to the Lunations is in need of updating. But unlike the top watch on that list, it does it in such a way that it reopens the challenge of creating an extremely precise moon phase in atypical formats. I always appreciate the atypical because I love seeing unique ideas come to life. Using a disk that creates a glowing region on the translucent moon is genius and something I personally haven’t seen before. There have been some that create the illusion of a shadow or use smoked sapphire crystal to cover the moon, but nothing like this. Though don’t let the moon phase function confuse you: the disk that sweeps across the rear of the movement is still technically the moon, so when it fully covers the optical fiber moon it depicts a full moon. The Lunations moon phase comprises two moon disks on the rear of the movement made with RC Tritec’s Lumicast, a luminous pigment that glows extremely brightly. The moon disks rotate very closely to the rear of the optical fiber moon, which, thanks to how light transmits through optical fibers, makes the disk seem like it is fairly close to the surface even though it is going through the entire movement. When worn on the wrist, the moon seems dark, especially at new moon. As the luminous disk sweeps into the window, the white disk creates a bright spot similar to the sun-drenched portion of the moon. When seen in the dark or under a UV light, the moon disk glows through the optical fiber. The sweep continues until the window is dark again and the cycle starts over. The cycle, accurate to about 14,000 years before being a day off, is very easy to set. On the rear of the case the moon disks are supported by skeletonized frames mimicking Sarpaneva’s characteristic dial design. These frames feature large arrow shapes that point to the edge of the rear window, where along the case back edge a graduated scale is engraved around the bottom half. The scale, with zero at 6 o’clock, represents the 29.5 days of the lunar cycle, also called a lunation (hence the watch’s name), and has 14.5 days’ worth of graduations either side of the zero. The zero represents full moon; at new moon the arrows point to the ends of the scale. The moon phase is set by pulling the crown out to the first position and rotating the moon disks to the closest mark corresponding to the current point in the lunation. This can be aided by the Sarpaneva moon phase app (which our editor-in-chief swears by), which is available for both iPhone and Android. For the super nerd, hacking seconds enables setting the moon phase to the exact second. In this case, one would set the time to the last full or new moon (whichever was closer), adjust the moon phase to match, and then advance the time (counting the days) to the current time. This is easiest to achieve on the day of new or full moon. But given that once the moon phase is set, if worn regularly and keep it adjusted to the current time, you won’t ever need to set the moon phase again (at least until you have it serviced and it gets completely disassembled), so the small amount of effort to set it super accurately is small potatoes compared to its potential long-term precision. In the end that precision, combined with the very special way the moon phase is displayed, is what truly sets this watch apart from its contemporaries. On the surface Lunations almost seems a relatively normal moon phase watch, albeit one with a very detailed dial as nothing too crazy jumps out right away. Closer inspection, however, reveals that Lunations has so much more to it than a cursory glance reveals. And when you really get into the details behind the Moonment caliber and how the moon phase functions, you realize that you are looking at something rare in the world of watchmaking. You are looking at something very new. My own journey with the Sarpaneva Lunations has taken the better part of the last year since I first saw it in 2018 and anxiously awaited the final production version, which was released at Baselworld 2019. But this pales in comparison with the time Stepan Sarpaneva must have spent to develop his own movement and to create something so unique. Based on the responses I have seen by those who attended the show and saw the piece, the wait has been well worth it. Sarpaneva deserves huge congratulations for such an incredible piece. Now my wish is that I get more time with it and see where he takes it from here. But until then the breakdown! Wowza Factor * 9.2 The power of that moon phase brings the Lunations to another level! Late Night Lust Appeal * 88.8» 870.830m/s2 The lust for this one has been building since its first appearance in 2018! M.G.R. * 67.1 An in-house movement from Stepan Sarpaneva combined with an optical fiber moon accurate to 14,000 years is ultra geeky! Added-Functionitis * Mild Again, the complication itself is extreme, but it only has one added function, so you just need the children’s strength Gotta-HAVE-That cream even with the serious horological mastery. Ouch Outline * 10.9 The moment that pencil in your pocket stabs you in the thigh! When you are working on a big project and running back and forth doing multiple tasks, you end up sticking things in your pockets you probably shouldn’t. Sometimes they remind you painfully. Still, I would take a sharp stab in the thigh if it meant getting the Lunations on my wrist! Mermaid Moment * 14,000 years! That isn’t the time it takes to fall in love, but the amount of time before you ever even need to think about how infatuated you are! Awesome Total * 760 Divide the number of years before the moon phase is off by one day (14,000) by the number of jewels in the movement (20) and add hours of power reserve (60) for a stunningly lunar awesome total! For more information, please visit www.sarpanevawatches.com/sarpaneva-lunations.